Hire a girlie reporter who did her basic training on the Hello Magazine and takes pride in having "exclusively covered the Strictly Come Dancing aftershow party, reported on the Brit Awards". Such are the proudest professional moments of the new Sunday Telegraph fisheries expert. Make sure she is badly-briefed and then send her off to Reykjavik to cover an issue about which she clearly knows nothing, put the result in front of an ignorant editorial desk and the result is a badly-framed mish-mash, of which any reputable newspaper would be ashamed. The lack of coherence, however, is not confined to the Sunday Telegraph girlie. The Sunday Express does just as badly, also inventing a biff-bam Iceland vs Britain story on the lines of the Cod War. Thus to frame the story is completely to misunderstand (and misrepresent) what is going on. This is a four-way fight which has the EU and Norway on one side, and the Faroe Islands and Iceland on the other. The fault lies almost entirely with the EU and Norwegians, both having behaved in a disgusting fashion. They have demanded 90 percent of the North Atlantic mackerel quota based on historic rights (track record), even though the fish have moved north into Faroese and Icelandic waters. What we have, therefore, is a situation where the EU/Norwegian licensed fleet is continuing to fish its traditional grounds within established national boundaries. They are not in any way encroaching on Icelandic waters (or Faroese for that matter), which was the basis of the Icelandic Cod War. The dispute arises from the EU and Norway effectively seeking to prohibit these two countries from fishing in their own waters, after the mackerel have moved into their territorial zones - even though not to fish them may harm indigenous stocks of herring and blue whiting, and deplete food supplies. From our perspective, though, the really interesting thing about the whole dispute, is what the ignorant hacks have completely missed. The UK – although having two dogs in the fight (holding 60 percent of the EU mackerel quota, while also processing fish from the Iceland and the Faroes) – has no seat at the table. Negotiations are being carried out between parties to the North East Atlantic Fisheries Commission, of which we are no longer members. Our seat has been taken up by the EU which negotiates in our place. Thus, while girlie Harriet and her counterpart on the Express can go trotting off to Reykjavik to discuss matters with Iceland's chief negotiator Sigurgeir Thorgeirsson, that is the one thing that British ministers are not allowed to do. Negotiating rights are reserved to the Fisheries Commissioner, Maria Damanaki, a Greek leftie politician, who seems more concerned with propagandising than ending the problem. All the Brits can do is seek to "influence" the Commission is a so far vain attempt to resolve the dispute. Despite this, the Express consistently seeks to give the impression that British ministers are directly involved in negotiations, which they are not. Even the girlie is woefully behind the times. 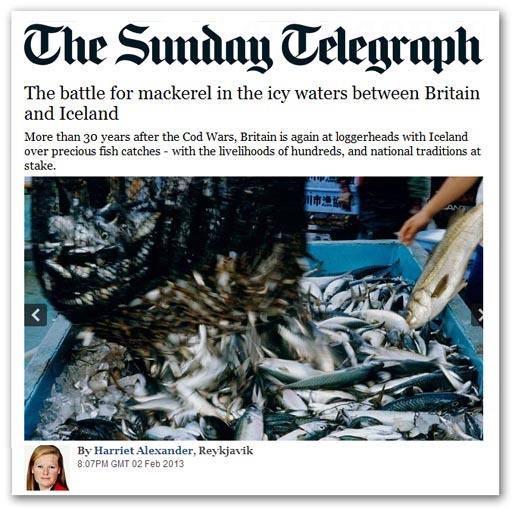 There is pressure, she chirps, "for the European Union to impose sanctions on Iceland – threatening to block imports of other fish – unless it dramatically scales back its catch of mackerel, in a variation of the infamous Cod Wars in which navies were summoned and fishing boats rammed". One of the conditions required is the obligation under WTO Rules for both parties to demonstrate that they are open to negotiation and their willingness to engage in "sustainable fishing". By claiming 90 percent of the stock (even if it is in the framework of an overall quota reduction), the EU does not really seem to be demonstrating a willingness to negotiate, and is on a perilously weak footing. Despite this also, the Express - which bases its whole story on the prospect of sanctions -writes that "the mood among many fishermen is for tough sanctions now". The paper does not even beginning to explain why they are not going to happen. If it was just the girlie getting it wrong, we might suggest she goes back to the Hello Magazine where she clearly belongs. But that would be unfair if it also left James Murray of the Express in place. Neither are use nor ornament, which just about sums up the legacy media which employs them. I don't know how often we have to restate this, but here lies yet another example of the old adage: you may be uniformed if you don't read a newspaper (or a blog), but if you rely on a newspaper, you will end up misinformed.